He was elevated to the Order of the Chivalry on October 13, 1973 by Henrik and Seitse, King and Queen of the West. As Henrik could not attend, he delegated the authority to his Queen. 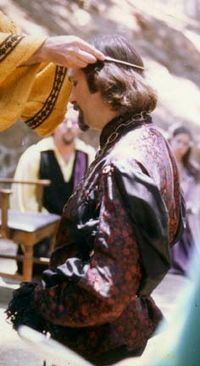 As the Queen was not herself a knight, Duke James Greyhelm held the sword during the dubbing. He became Caid's first Prince on 06/04/1974. Viscount Christian passed away at approx. 5pm on September 19, 2017 in Lake Havasu, Arizona as a result of complications in the heart surgery. . . .Once more I want to touch on the subject of starting events on time. During my reign you have the unfortunate pleasure of not only a Prince who is tired of "Society Time" but you also have a Princess who was brought up to believe that it is better to show up 15 minutes early than to show up 15 minutes late. Now I can understand a person being late if he or she has to work until a certain time, but that person cannot expect the Society to come to a stand-still because he or she isn't there. If an event is scheduled for 9 a.m., and you know it's a 2-1/2 hour drive to get there, you should leave home by 7:30 a.m. at the latest. If you show up too late to sign up for the lists, and your only excuse is that you have such a long way to drive, don't expect any sympathy. Showing up late for the sole purpose of showing up late is inexcusable. And so, to keep up with our policy of being on time, I must close now so that this message will not be late to press! This page was last modified on 27 September 2017, at 22:01.